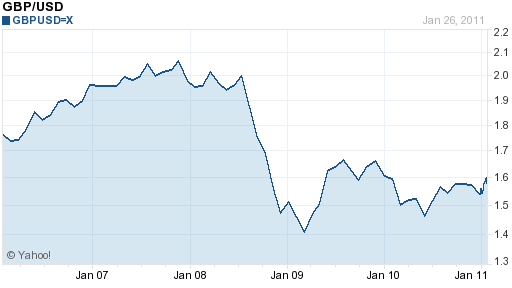 The last few years have been volatile for the British Pound. In 2007, it touched a 26-year high against the US Dollar, before falling to a 24-year low a little more than one year later. During the throes of the credit crisis, analysts predicted that it would drop all the way to parity. Alas, it has since managed to claw back a substantial portion of its losses, and finished 2010 close to where it started. At the moment, however, there are two contradictory forces tugging at the Pound, which could send up upwards against the Euro but lower against the US Dollar. The first is the sovereign debt crisis in the EU, which flared up dramatically in 2010 and currently threatens to crippled the Euro. I will offer more commentary on this issue in a later post; for now, I just want to point out its role in supporting the Pound. While the Dollar is the Euro’s chief rival, many traders have turned to the Pound (and the Swiss Franc) because of their regional proximity. “As long as the euro-zone debt crisis is in the focus of the market, it will be the main driver of euro-pound,” summarized one strategist. The second force (or set of forces) is propelling the Pound in the opposite direction. Basically, the UK economy remains depressed. Thanks to an unexpected contraction in the fourth quarter, GDP growth in 2010 was an exceptionally modest 1.7%. This was hardly enough to compensate for the average annual growth of .1%/year from 2006 to 2009, and send the Pound tumbling. Forecasts for 2011 and 2012 have since been revised downward to about 2%. In order to spur Britain’s export sector, the Bank of England has deliberately acted to hold down the Pound, which it has managed to achieve through a combination of quantitative easing and low interest rates. “For a long time that’s what we were targeting, and we managed to get it down by about 25 percent — the exchange rate, that’s had a huge benefit to the U.K. economy,” a former member of the monetary policy committee recently admitted. An unintended byproduct of this policy has been price inflation. At 3.75%, the inflation rate is among the highest in the industrialized world, and certainly the highest among G4 currencies. At the very least, the Bank of England will have to suspend any aspirations to match the Fed in printing more currency and expanding its QE program. It will probably also have no choice but to raise interest rates, which it might otherwise not have done until the economy is on more solid footing. The markets are currently projecting an initial rate hike of 25 basis points in the third quarter, and for the benchmark rate to exceed 1.5% by the end of the year, compared to .5% currently. It’s difficult to say how the currency markets will make sense of this. 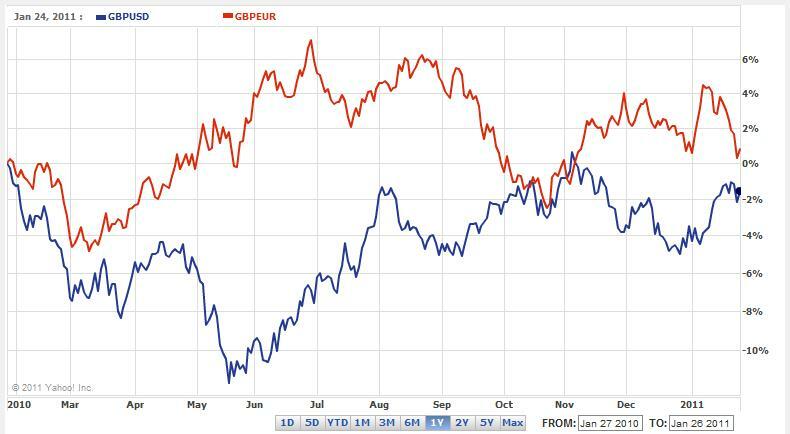 Given that real interest rates will remain negative (due to inflation), it seems unlikely that any yield-seeking investors will suddenly start targeting the British Pound. In addition, given that the risk of ‘stagflation’ in the UK is now real and that the government is set to assume a record amount of new debt over the next few years, risk-averse investors will probably stay away. According to the latest Commitment of Traders report, speculators are already starting to establish bearish positions against the US Dollar. While the Pound looks vulnerable, the big unknown is ultimately the EU fiscal crisis. If one of the peripheral members leaves the Euro, as some commentators predict will finally happen, then all bets (for the Pound, etc.) are off.